A simple, affordable and apparently foolproof solution to the problem that has led to the current worldwide ‘demonisation’ of diesel engines — emissions of life-limiting NOx — has been discovered by a team of British automotive research specialists at Loughborough University. The system, called ACCT (ammonia creation and conversion technology), has reached such a promising stage that the creators are being besieged by car manufacturers, component suppliers and even owners of large diesel fleets that have heard about the innovation and are desperate to use it to solve what they see as motoring’s most urgent problem. 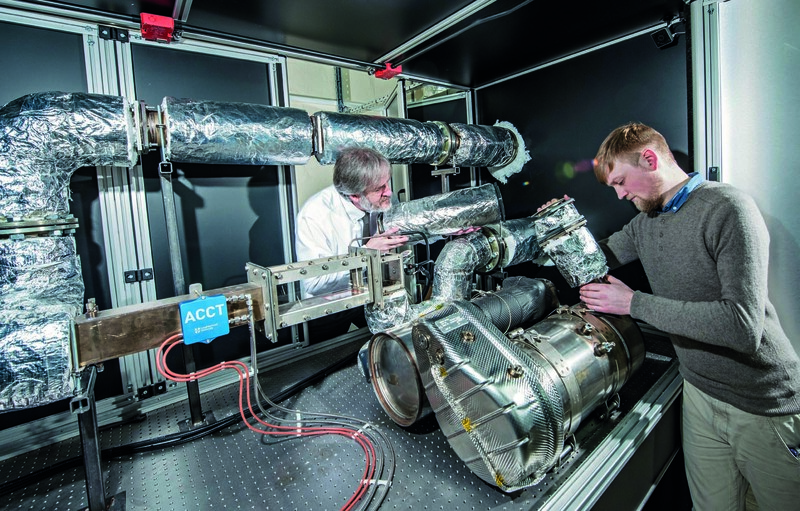 The team — led by Graham Hargrave, professor of optical diagnostics, and Jonathan Wilson, research associate — has been working on exhaust missions for many years but achieved its breakthrough in the past two. From its current state, ACCT should be fairly easy to engineer, the team believes, and could reach production within two years "with the right support”. The Outlander isn't just available as a PHEV: how does the diesel version compare to seven-seat rivals such as the Nissan X-Trail and Skoda Kodiaq? In essence, the system converts AdBlue, the universally available urea-based after-treatment, into a special ammonia-rich ‘ACCT fluid’ under accurately controlled conditions in an exhaust-mounted chamber. Like current selective catalytic reduction (SCR) systems, it then uses freed ammonia “literally to rip NOx apart”, leaving only nitrogen and water. The crucial difference between the two systems is that ACCT fluid keeps working at high efficiency in low exhaust temperature conditions that challenge current systems. Preliminary tests on a city-based stop-start Skoda taxi indicate that ACCT can capture 98% of exhaust-borne NOx, compared with 60% for the same car running a conventional EU6 system — even before researchers had a chance to ‘tune’ the ACCT system for the best performance. Experts with knowledge of the development are starting to talk in terms of “virtually zero-emission” diesel engines and citing ACCT as being even more important than the arrival of the common-rail diesel. In the past decade, NOx has become an infamous problem. It springs from the fact that diesels become more efficient as they run hotter, but this heat increases their NOx output. The effect has led to rapidly rising awareness of NOx’s detrimental effect on health; current European research suggests it shortens 71,000 lives a year. Since 2014, the practice of injecting diesel exhausts with AdBlue via SCR exhaust catalysts has proved effective in most situations and has dramatically lowered average NOx outputs. But, as the Loughborough researchers point out, gaps in SCR’s effectiveness remain – notably when low exhaust temperatures prevent complete decomposition of AdBlue, such as when a vehicle is idling in traffic, especially in stop-start conditions. NOx outputs rise when SCR doesn’t function well, and that's the root of recent reports that even new-car exhausts sometimes produce multiples of permitted NOx levels. As Hargrave explained, there’s a deep irony in this. While NOx has hit the headlines, CO2 continues to kill the planet. “NOx is serious,” he said, “but it’s really a point-source problem. It only matters in a tiny minority of locations. Because of concerns over NOx, Europe’s diesel market is in near chaos. Sales of oil-burning cars have collapsed by 20%, putting pressure on margins and infrastructure. A swing to more CO2-heavy petrol vehicles means CO2 targets are being missed — at the very moment these targets are about to tighten. For light commercial vehicles, there’s no realistic prospect of reducing diesel use in the short term. Market experts don’t believe buyers will entertain a rapid change to downsized petrol engines or hybrids. For heavy goods vehicles, the situation is much worse. Whereas car engines are ‘dialled back’ on NOx and need only light doses of AdBlue, trucks need much more. In cold-exhaust conditions (winter, for example), the incomplete breakdown of AdBlue leaves damaging and almost immovable exhaust deposits in complex exhaust systems that reduce power and even immobilise trucks completely. Understandably, the market in defeat devices for HGVs is lively. The Loughborough team says it now needs a heavyweight technology partner to take ACCT to production but is wary of ceding valuable intellectual property rights cheaply. Negotiations between the university’s IP specialists and prospective partners are in full swing. “Our sense is that we need a major supplier rather than a single manufacturer,” said Hargrave. Whatever ACCT’s route to market, an increasing number of potential users are desperate to see its progress. It could lead to a whole new lease of life for diesels. If ACCT changes diesels, as seems likely, it will be because Wilson decided to do a PhD at Loughborough University. Hargrave, his professor, explains: “We’ve known for ages there was an NOx problem with AdBlue and low temperatures. Jonathan had an idea that could solve it but needed the opportunity to develop it, so we went to the university and organised an internal scholarship. He’d worked on a similar topic through his undergraduate years. Now if the could only makes the fumes smell better too!!! The EU has only itself to blame for the huge diesel scandal since the EU Commission let itself fool by the very powerful German car industry lobby with its manipulative emission testing trickery. This British invention may well show up too late. what we need to do is get the millions of non-eu6 compliant smog spewing crap heaps off the road first. Then focus on eu6. Not the other way around as the current regime has enacted. Good news for manufacteurs, it will be an important tool to comply with nem wlemission standarts. This is great news for hgvs and all the delivery vans out there, for cars diesel is still surely only going to benefit the high milers, get all the town users and low mileage drivers that bought diesels due to tax incentives into hybrids, electrics, and downsized petrols as these now all compare well with CO2 emissions, and perhaps reverse this fad for bigger heavier suvs over standard hatches, cars with a lower weight will naturally be more economical and environmentally friendly. What a fantastic breakthrough. The best bit is, it kicks out nitrogen which is most of what we all breath. Diesel could become the Goldilocks fuel - high mpg, good low down torque, low CO2 and no NOx. Bye bye battery carrying white elephants - and take your range anxiety with you....! This technology will only save diesel if the rapidly evolving technology of batteries and renewable energy suddenly came to an abrupt halt. Since that seems unlikely, they are just beating a dead horse here. That is exactly why the ICE offers will still interest a big part of the market going foward, few people will want to buy a EV for 30-40K £ knowing the technology inside will be obsolete within 2-3 years. Why will new 23-28K £ LEAF become obsolete in 2 years time? Do they stop working?